This is the third installment in my Tale of Two Properties serial. I have already posted about this site’s preparation work including removing the old wine at the site. Next we drilled holes at least 50 cm (20 inches) deep to accept each new wine vine plant. Drilling to plant new vines. Working around the trees and progressing along marked out rows, drilling the holes for planting took about a day and a half. Holes were dug one meter (40 inches) apart (a common inter-vine spacing used in our wine zone). New wine vines staked and planted. Property 2 is less developed. The site was tilled for the summer and will be allowed to rest with planting to be done this fall. Part of the reason we did not plant this site was that the new wine for this site was delivered too late to for us to plant properly. So deep trenches were dug, and the vines were simply planted close in the trenches for over summer growth. They will be dug up in the fall and planted in their final rows. Property 2: Tilled and foreground prepped for over summer temporary planting of current wine plants. 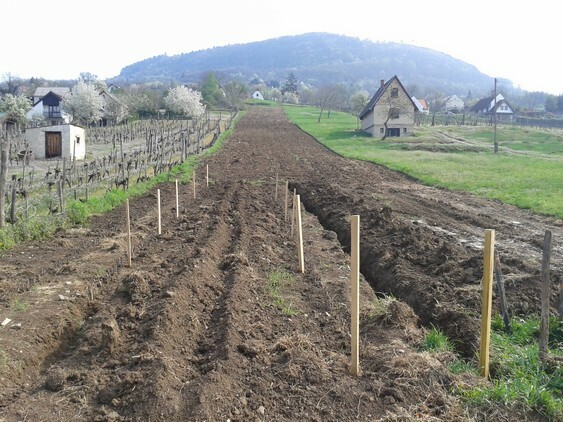 Close spacing of temporary wine planting for summer season.